A universal gait nursing belt for easy ambulation of patients and caregiver. This transfer belt is easy to clean, comfortable for the patient, and will not prone by wearing it, and won't tear even with hard use. Size: Fits waist sizes 38" to 46" - Belt Dimensions: 46" x 4"
①Safety transfer waist belts with release buckles can effectively help patients or loved ones safely transferring patients, walking and ambulation, prevent falls and other embarrassing situations. ②The six strong grab handles: four vertical and two horizontal handles allowing the caregiver to move the patient from the best everage point from any side and any angle, making the patient safer and more comfortable. ③Four inch back is wider than traditional gait belts for more comfort and greater contact area with the patient. ④The durable quick plastic release buckles of the waist allow the belt to be easily attached and separated. ⑤Great for home or hospital use: makes transferring patients from beds, chairs, wheelchairs and walker simple. This is a good choice for good quality and competitive price, now click the Add to Cart button to buy it! 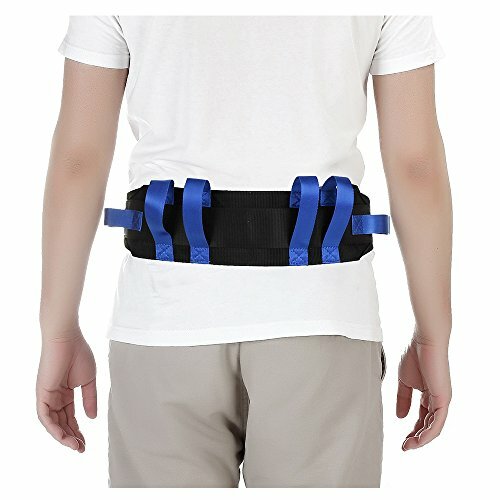 This transfer belt is easy to clean, comfortable for the patient, and will not prone by wearing it, and won't tear even with hard use.Fits waist sizes 38" to 46" - Belt Dimensions: 46" x 4".The durable quick plastic release buckles of the waist allow the belt to be easily attached and separated. Safety transfer waist belts with release buckles can effectively help patients or loved ones safely transferring patients, walking and ambulation, prevent falls and other embarrassing situations. Makes transferring patients from beds, chairs and wheelchairs simple. Great for home or hospital use. The six sewn firmly handles have four vertical and two horizontal handles, allowing the caregiver to move the patient from the best everage point from any side and any angle, making the patient safer and more comfortable. Four inch back is wider than traditional gait belts for more comfort and greater contact area with the patient.